Former British PM Tony Blair reiterated on Sunday some of his previous half-hearted “apologies” for illegally launching a war of aggression on Iraq in 2003. Blair has never apologized for increasing Iraqi mortality or death rates, leaving hundreds of thousands of Iraqis dead. Blair admitted that the invasion in some ways led to the rise of Daesh (ISIS, ISIL). But he argues that Daesh was “barely known” in 2008. This is not true, and is another sign that Blair as prime minister wasn’t paying attention. Blair-Bush blamed all the violence in Iraq in 2005-06 on Abu Musab al-Zarqawi, the leader of al-Qaeda in Mesopotamia. On his death in May 2006, the organization changed its name to the Islamic State of Iraq and was led by the shadowy Abu Omar al-Baghdadi. Anyone following Iraq in 2008 knew that ISI was a major insurgency group. They took over territory in parts of Diyala province. “The statement cites President Bush in his press conference, October 2006, as saying that “America’s presence in Iraq is precisely to thwart the establishment of “a strong Islamic state, caliphate,” which will “endanger Western interests and threaten America at home.” The author also says that 70 percent of the Sunni tribes support the Islamic State of Iraq. The 70% figure is ridiculous. But to say that Daesh was barely mentioned in 2008 is simply a lie, since Bush was actually giving its strength in Iraq as a reason the US occupation had to remain: the ‘caliphate’ had to be defeated. (There was no al-Qaeda or ISI in Iraq, to speak of, before the US & UK overthrew Saddam Hussein). Blair also suggested that the outbreak of youth revolutions in 2011 would have anyway thrown Iraq into turmoil. That may or may not be true, but it has nothing to do with his invasion of Iraq in 2003. “Former British Prime Minister Tony Blair is complaining that he is unfairly blamed for causing the current mess in Iraq and that if Saddam had still been in power it would be just as unstable. He is, perhaps deliberately, missing the point. His invasion of Iraq was illegal and based on deception and propaganda. That was what was wrong with it. A quagmire that is the fruit of illegality and fraud is the worst. The UN Charter allows of only two legitimate grounds for war. One is self-defense. 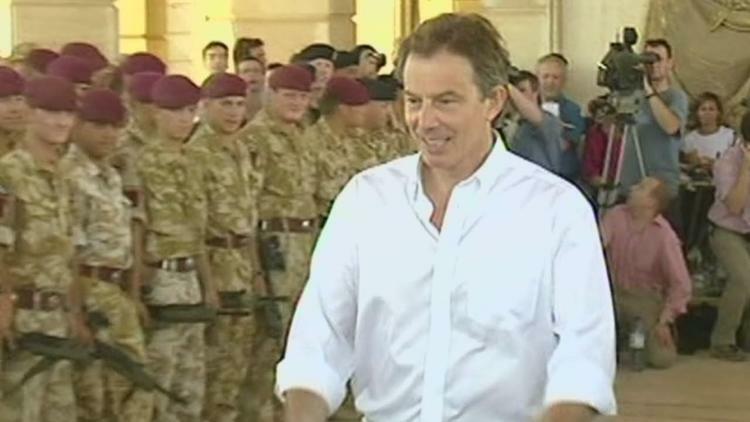 Blair was not defending Britain from Iraq when he invaded and captured Basra. Blair gave the opposite impression to the public. He delivered a bizarre speech in which he said that Saddam Hussein could deploy weapons of mass destruction against Europe in as little as 45 minutes. It is not even clear what that assertion could possibly have meant. Iraq had no delivery system for getting chemical weapons to Europe, and you couldn’t have hoped to obtain so much as a sandwich in Baghdad in only 45 minutes. Saddam in any case had no such weapons. British officers scratched their heads and supposed that Blair had misunderstood some briefing he received. Blair had wanted to misunderstand the briefing. The British ambassador in Washington during 9/11, Sir Christopher Meyer, revealed that the Bush crew wanted an immediate war on Iraq in September 2001. Blair was afraid that if the Neoconservatives left Bin Laden and his training camps in Afghanistan alone and ran off to Iraq, that al-Qaeda would be free to hit London next. So he did a deal with the devil and persuaded Bush to hit Afghanistan first, with the promise he would support an Iraq war later. The ambassador also revealed that the Neoconservatives were worried that the grounds on which they wanted to hit Iraq could also be invoked against Israel (ethnic cleansing, weapons of mass destruction, wars of territorial aggression). They needn’t have worried. Fairness is not a feature of american foreign policy discourse. The other grounds for war is a resolution of the UN Security Council designating a regime a threat to world peace. The UNSC declined to so vote with regard to Iraq. The UN Charter was designed to prevent more Nazism and wars of aggression. Undermining this edifice of law encourages militarism and aggression. Some argue that a third grounds for war should be added, prevention of an obvious genocide. This principle can be debated, but there was no genocide going on in Iraq in 2002, and the Bush-Blair invasion and occupation significantly increased mortality rates. The Saddam Hussein regime did kill people. But many of those died in the Iran-Iraq War, in which Reagan and Thatcher backed Iraq, the clear aggressor. To then use the casualties of that war as a basis for invading Iraq in 2003 is Orwellian. Blair’s smarmy Christian crusaderism and hatred of Islam drove him to justify the wicked means by what he saw as noble ends. In summer of 2002, the head of MI-6, British intelligence, visited Washington to consult on the budding war. He was appalled at the atmosphere of intrigue and deception and reported back to London that the intelligence was being fixed around the policy. In intelligence circles, analysts and field officers who tell the executive what it wants to hear, despite the contrary known facts in the field, are called weasels. Sir Richard Dearlove was warning Blair that elements of the CIA and the Pentagon (the ‘Office of Special Plans’) had turned weasel. Deerlove did not realize that Blair himself was a weasel. Blair suppressed the memo. Blair denied that petroleum was a motivation in the war. But we now know that BP vigorously lobbied him in fall 2002 to make sure it got oil bids after Saddam was gotten rid of, afraid that two Texas oil men in the White House would cut them out of the deal. As it turns out, burning petroleum is destroying the world and inflicting extreme weather events like enormous floods on the UK and it should be outlawed, much less fighting wars to get the poison out of the ground. Bush and Blair met in winter 2003 and discussed how to bait Saddam Hussein into providing them with a legal cause of war. They considered flying planes over Iraq with UN insignia, in hopes a trigger-happy Iraqi soldier manning an antiaircraft battery would shoot it down. The whole enterprise was false and low in every way. Blair said Sunday that he misunderstood how the chemical weapons would have worked. Blair never apologizes for breaking international law by launching a war of aggression. Blair is about to receive some negative reviews in an official commission report on the inception of the Iraq War, and a lot of people think he made these remarks now to forestall being lynched by the public and the media.